Fortune REIT was spotted by our ART SuperTrend System after breaking out of the sideway consolidation. 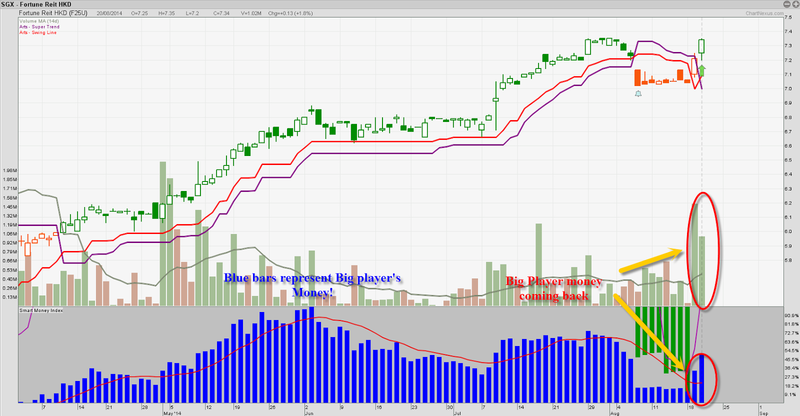 This could be sign of a Uptrend continuation, Big player money also spotted on the rise. and this stock is paying over 6% dividend p.a. Fortune Real Estate Investment Trust (Fortune REIT) is a real estate investment trust. The principal activity of Fortune REIT is investment holding. The Company, together with its subsidiaries, is engaged in the owning and investing in a portfolio of retail shopping malls located in Hong Kong. Its properties include Fortune City One, Ma On Shan Plaza, Metro Town, Fortune Metropolis, Waldorf Avenue and Caribbean Square. Fortune REIT housed a total of 1,031 tenants as at 31 December 2011. As of December 31, 2011, Fortune REIT owned a portfolio of 14 retail malls and properties in Hong Kong, consisting of approximately two million square feet of retail space and 1,660 car parking lots. Fortune REIT is managed by ARA Asset Management (Fortune) Limited, a wholly owned subsidiary of ARA Asset Management Limited. On February 17, 2012, the Company acquired Belvedere Square and Provident Square. In January 2014, the Company acquired Kingswood Ginza Property. "If you thought Mapletree’s results were impressive, Fortune REIT’s numbers are even better. The company said second-quarter revenues and income increased by over 30%. Fortune REIT looks appealing given that it is valued at just 3.6 times earnings and priced at only 70% of its book value. A jump of around 27% in the income available for distribution also allows Fortune REIT to boast a distribution yield of over 6%."